Small and intimate, Gorse Hill stands as a fine example of elegant country mansion architecture set in the heart of Surrey. It's an ideal location for touring the surrounding countryside or for those seeking a base outside the capital. If leisure's your endeavour, why not indulge in a game of tennis. 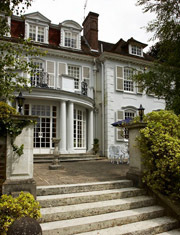 Getting here is easy – with quick access from the M3 and M25 motorways as well as Heathrow and Gatwick airports by rail.